Saguaro Lake is the fourth reservoir on the Salt River Chain of lakes, formed by the Stewart Mountain Dam. The lake is the closest and most accessible to Phoenix AZ. The lake lies within the Tonto National Forest in Maricopa County. 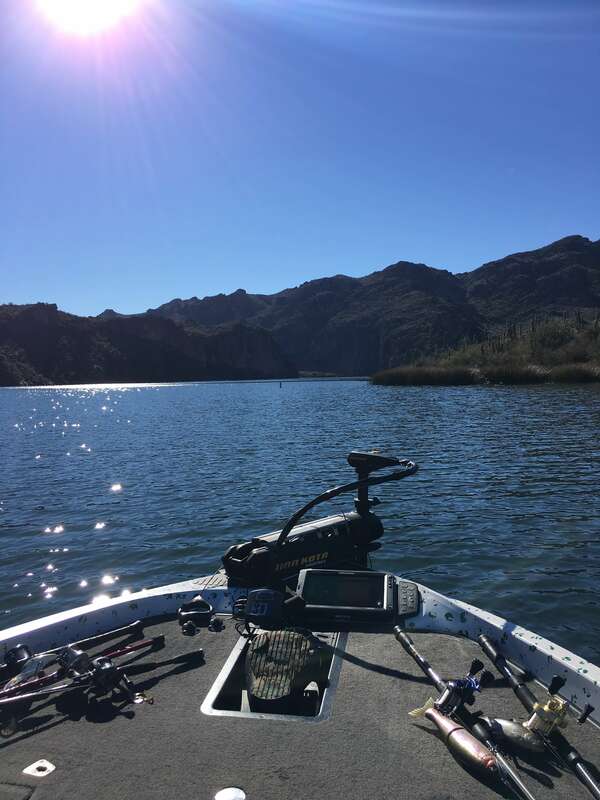 Saguaro Lake is our most popular guided fishing trip package, for good reason. 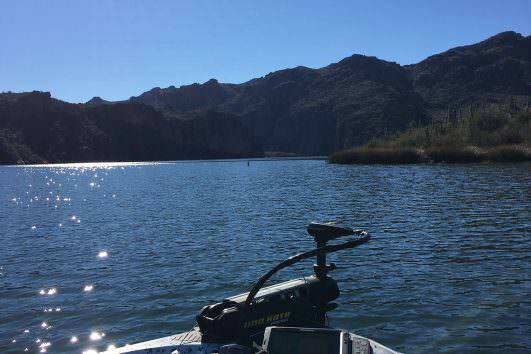 The bass fishing at Saguaro lake is as good as anywhere in the country, with a chance at the biggest largemouth bass of your life. 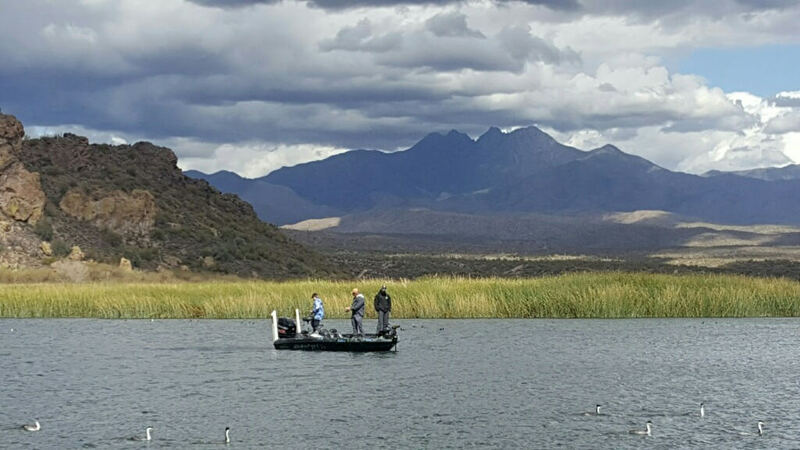 View our other guided fishing trips to Canyon Lake or Roosevelt Lake. Our guide, Jason Thompson, was extremely professional and my son and I had an awesome time. The boat was spotless, the gear was top of the line, and we caught fish every spot we went to! Jason coached is on proper technique so whether you are an experienced fisherman or a first timer, you will not be disappointed! Highly recommended to anybody. My dad and I flew in from North Dakota to do some bass fishing with Jason Thompson of Addicted Bass Guides. We had a great time! We are both walleye fisherman, so it was fun learning new techniques from an experienced angler like Jason. Caught the biggest bass of my life on the trip! Also, Lake Saguaro was a beautiful lake, so the scenery and weather were nice to take in as well. Whether you are new to bass fishing or an experienced fisherman, my dad and I would definitely recommend Jason for your next adventure. He knows the lake, has a great boat and equipment, and a lot of knowledge that he is willing to share to help make your trip a success! Thanks, Jason! We will see you again soon! Thanks for another Awesome fishing trip! Whenever we visit Phoenix we contact Jason. He is the best. He has everything you need to get you the big catch. He knows where the fish are biting and what to use to get them on the line. Book the entire day because time flies when your having fun!!! We had a blast fishing with Jason. He is an incredibly patient guide. I learned a lot from him as well. And yes, we caught fish. Thanks Jason. We will be back. Personally fished with JJ for many years including placing high in a lot of tournaments with him. JJ is an awesome bass fisherman and a great guy to spend a day on the boat with and will put you on some monster fish! Keep slayin em cutty!!!! Great day fishing with Mike on Saguaro lake. He is a great guide and a true professional He is very personable and willing to share his knowledge of the lake and the latest techniques. We caught over 20 bass and missed a number more. He has great fishing and golf stories as well. My only guide service to use while in the Scottsdale area. My fishing partner and I had a great time fishing Saguaro Lake. As trout anglers, we wanted to give bass fishing a try, but had no experience. Our guide, Jason, gave comprehensive instruction on techniques to land big bass. It was a lot of fun! Additionally I got some great photos of bass I caught to send to my friends back home. All the tackle and lures were provided, and the equipment was high quality. The boat was outfitted with the latest technology to get anglers on the fish, making the most of the time on the water. I’m already looking forward to my next guided trip with Jason. I can’t recommend this guide service highly enough. Perfect trip for the morning! We spent 4 hours on the water and hauled in many large mouth bass around 4-5 lbs. Jason’s boat has the best equipment for finding fish and he has the experience to put you on the fish. Highly recommend this fishing trip!